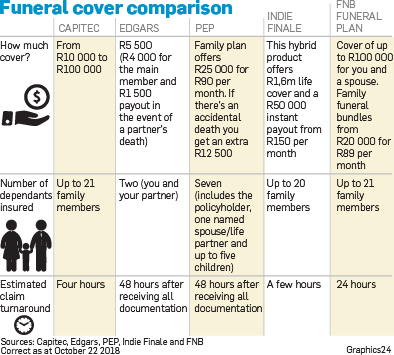 There are lots of providers offering funeral cover, and South Africans can choose between retailers, banks and insurance providers. But not all funeral plans are created equal. Retailers themselves don’t offer funeral cover directly, says Peter Castleden, the CEO of IndieFin. “The majority of retail providers are selling a white label product. A lot of them don’t have their own funeral licence. They will take a Hollard product, for example, and put their name and colours on it, but it’s still underwritten by Hollard. "The price may differ slightly. It’s quite easy to compare products if you look at cover versus premium,” he says. On the whole, financial institutions offer more cover and are better equipped to turn claims around. While retailers may offer a cheaper product, the cover may not be as comprehensive. Some may have quite a few “frills”, while others will have their frills trimmed back. Burial repatriation, for example, is an included benefit in Capitec’s product, while Pep says on its website that it has a 24-hour call centre that can help get you discounted rates. CAN RETAILERS GIVE YOU A RAW DEAL? The short answer, according to Castleden, is no. “The legislation is strict and determines how much cover you can get, which everyone has to comply with. There is quite a lot of variation in terms of bells and whistles,” he says. Karen Bongers, product development actuary at Sanlam Individual Life, says that additional features include things such as payments made towards burial repatriation, a memorial stone or groceries, or features like payment holidays during periods of unemployment or maternity leave. “These features are either included in the price or can be selected at an additional premium. Other products are simpler in design in that they simply pay out the cover amount, which the policyholder or beneficiary can then use at their discretion,” she says. But basic retailer products tend to only cover the insured and their partner or immediate family members. To compete, providers such as Capitec and FNB provide cover for up to 21 family members. Thami Madlala, financial planner at Standard Bank, says: “The payouts are usually the same because, by law, if you’ve been offered a certain amount of cover [for example, R20 000], the retailer or the firm is obligated to pay that out to you. However, where retailers can fall short is in the advice space, says Madlala. “Firms have qualified representatives who conduct a financial needs analysis to see how much cover you actually need to have based on your lifestyle and financial objectives. "Retailers usually offer you cover without any comprehensive advice given, and they don’t explain the product fully and do not disclose some of the fine print. "By conducting a financial needs analysis, financial firms can ascertain whether you’ve been overly covered or not, whereas, with retailers, they just push the numbers and offer you the product without any analysis,” he says. The advantage with retailers, though, is that they are more easily accessible than financial services firms. Madlala says this is because shopping centres are within arm’s reach, compared with financial services firms, which you have to travel some distance to access. 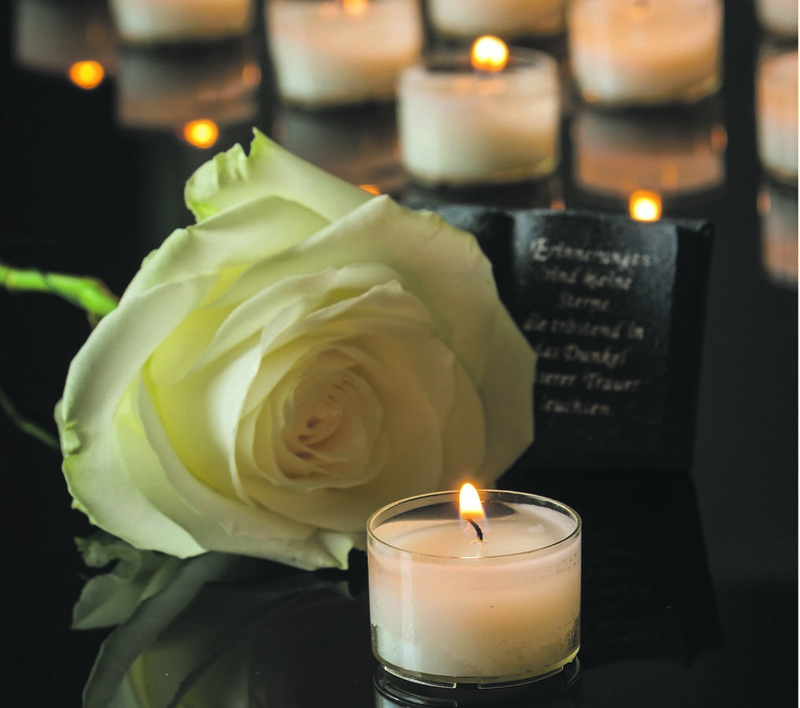 Funeral cover is a vital product to have, particularly if you don’t qualify for life cover. The benefit that funeral cover offers is instant cover. Life cover, meanwhile, has to be underwritten, which often means the applicant has to jump through certain hoops to qualify for a policy. Funeral cover is evolving, though, and there’s a lot of disruption in this space. Some providers, such as IndieFin, are now offering hybrid products, meaning their life cover has a funeral element in that a certain portion is paid out more quickly, while the underwriting is conducted before the remaining policy lump sum is paid out. To compete with the on-the-ground accessibility retailers offer, financial institutions allow customers to apply for funeral cover online or through their apps – Capitec, for example, offers lower premiums to customers who apply through its app. You can have more than one funeral policy, but the Financial Sector Conduct Authority has placed certain ceilings on how much an individual can be covered for. “This is to prevent cases of fraud from taking place and for other legal matters,” says Madlala. Many do take out more than one policy because, compared with life cover, funeral cover is easy to access. But it comes with a heftier price tag and experts warn against using funeral cover as a life policy. Bongers says: “Many South Africans have multiple funeral products with no life cover. "This is a very expensive way to insure your risk needs. Funeral cover should only be aimed at paying for funeral-related expenses, with life cover being taken out to cover the bulk of one’s risk needs. “Life insurance is cheaper as there is more underwriting involved, for example, medical questions, so that providers can understand the risk. Castleden explains: “They need to verify the claim, whereas, with funeral cover, it’s guaranteed acceptance.